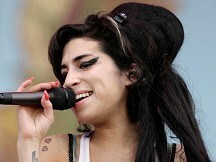 The Back To Black singer was found dead at her flat in north London on July 23. The family statement said: "Toxicology results returned to the Winehouse family by authorities have confirmed that there were no illegal substances in Amy's system at the time of her death"
It went on: "Results indicate that alcohol was present but it cannot be determined as yet if it played a role in her death. "The family would like to thank the police and coroner for their continuing thorough investigations and for keeping them informed throughout the process. They await the outcome of the inquest in October." An initial post-mortem examination proved inconclusive and an inquest was opened and adjourned with no cause of death given for the 27-year-old star. Because of Amy's very public battles with drink and drugs, news of her death was quickly followed by suggestions it could be related to one or the other. Her father, Mitch Winehouse, told mourners at her funeral that she had "conquered" her drug addiction and was "trying hard to deal with her drinking". Mitch also revealed plans to set up a foundation in his daughter's name to help people struggling with addiction. He had been forced to send back cheques to donors after it was revealed someone had already registered the Amy Winehouse Foundation Ltd with Companies House. But he has since tweeted: "It seems we have got our foundation back. I will update you all. Very positive."